When Vicki Breeman, a member of Christ the King Lutheran Church in Yankton, South Dakota, became the deacon overseeing the Outreach Committee, she was instrumental in helping the congregation focus upon local and regional ministry opportunities. Breeman is constantly on the lookout for opportunities to serve. One day she was driving by the Avera Sacred Heart Cancer Center and decided to introduce herself. She asked, “What can our congregation do to help?” Many people come to Yankton to receive treatment for cancer. Appetites become poor because of treatment side effects and, of course, budgets are stretched. Along with input from the cancer center directors, Breeman came up with a few ideas. One of those was their pillow outreach project. 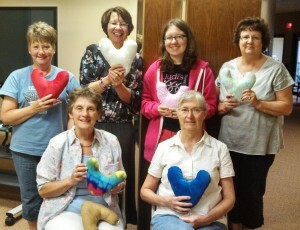 Christ the King members began sewing heart-shaped pillows for people with painful incisions. “Those pillows have been a blessing to many individuals. Last month, I visited a lady who had had surgery. She was sitting in a chair with pillows under both arms. I recognized the pillows right away as some we had made,” reported Pastor Dani Jo Ninke. In addition to the cancer center patients, Christ the King also reached out to American Indian reservations in South Dakota. Pastor Dani Jo knew that other congregations in the area frequently took mission trips to places far away, but she was troubled that some of the poorest of the poor live right in Christ the King’s backyard. The proximity of the Pine Ridge and Lower Brule reservations to the congregation made it easier to build relationships and become more sensitive to needs. Christ the King has spearheaded blanket and winter coat drives and has collected children’s books for libraries. For more information about the soup cone ministry or heart pillows, contact Christ the King at christtheking8848@msn.com.